Bicentennial Edition. 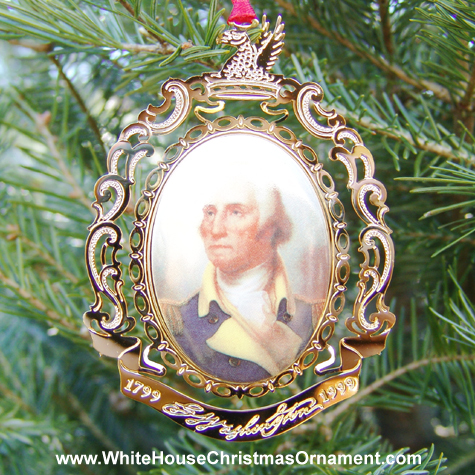 Commissioned in honor of the bicentennial of George Washington's death, this ornament depicts the beloved portrait by Rembrandt Peale, which was painted circa 1823. This fine porcelain ornament is bordered in 24-karat gold-finished brass. The frame for this ornament is inspired by the Washington family coat-of-arms. George Washington's signature is etched at the bottom, and his crest of a griffin issuing from a ducal coronet tops the ornament. It is a stunning oval ornament that would grace any collection.